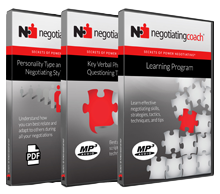 negotiatingcoach.com®, its teaching and coaching personnel, and its certified affiliates believe in and utilize the time-tested results- and decision-based Win-Win approach to teaching negotiating skills to our clients. We specialize in teaching people of all experience levels, across many different functional groups, in any industry, how to become more effective negotiators and seek out Win-Win, mutually beneficial outcomes. Attendees and participants in our negotiating skills training programs will be taught how to make all the right moves in a negotiation and how to counter moves made by the other side. To become effective negotiators, people must learn the proper process and methodology, as well as strategies and tactics, to optimize outcomes – and not just look for quick fixes and/or negotiating tricks. Our presentations, seminars, and learning workshops are instruction-based and can involve a combination of lecture-based presentations, thought-provoking and interactive discussions, troubleshooting, forensic negotiating examples, group exercises, breakout sessions, or demonstrations. Our negotiating skills training programs are focused and practical, and the learning is immediately applicable. Client- and industry-specific, customized negotiating simulations (live practice sessions or role-playing) can be developed for the Two-Day Learning Workshop, as well as for any follow-up consulting, coaching, or troubleshooting sessions with members of your organization. We strongly believe in “situational learning” and in the “live” application of our negotiating training process and methodology in our clients’ real-world business and personal negotiating environments. Ineffective role-playing, artificial exercises, easy practice sessions, excessive use of video clips, and academic case studies that are not relevant to each client’s negotiating environment will generally not result in the necessary transfer of learning into the marketplace. We focus on practical negotiating applications through the successful integration and implementation of a proven process and methodology, as well as strategies and tactics, into the day-to-day lives of program attendees or participants. We help our corporate clients with successful integration and implementation through our consulting, coaching, and troubleshooting expertise. Improving negotiating skills is hard work – the marketplace is demanding, competitive, and complex – so there is little room for “feel good” programs disguised as motivational events. These types of programs provide little or merely short-lived value and don’t really bring about lasting, measurable change in behaviour and improvement in business results.